A look at three of Tian Xia's most commonly worshipped deities: Hei Feng, the Duke of Thunder; Tsukiyo, the Prince of the Moon; and Shizuru, the Empress of Heaven. 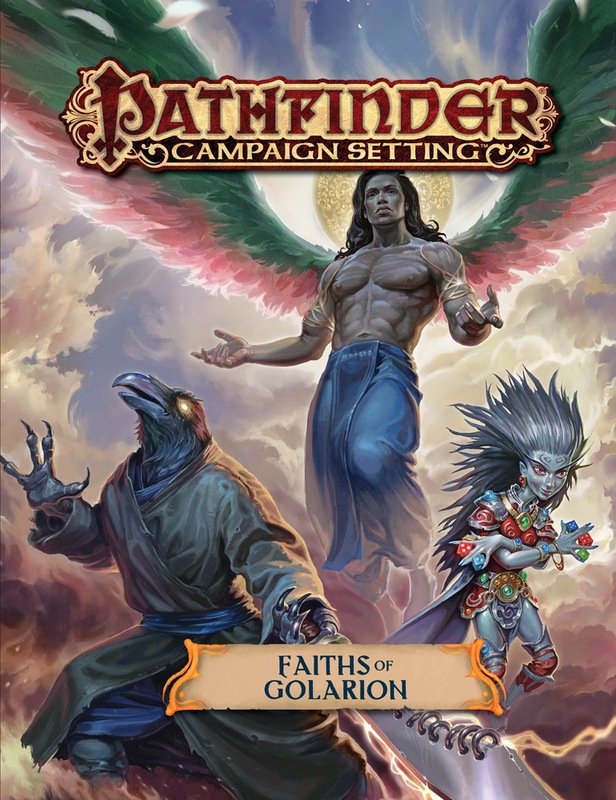 Pathfinder Campaign Setting: Faiths of Golarion is intended for use with the Pathfinder campaign setting, but it can be easily adapted to any fantasy world. Wheres that placeholder art from dont think ive seen it before. I'm pretty sure that's final art. I'm also sure it's the final cover. Hei Feng and Nivi Rhombodazzle are on the cover, and I suppose that angel like being is Gruhastha. And I should say, That's an AWESOME cover! I would love to see Thamir and/or Chaldira in it. And I'm actually sad to see Hei Feng in it. While he was awesomely illustrated on the cover, it could mean we are never getting something close to "Dragon Empires Faith", one of my most wished books, with 14 Tian Xia gods to be expanded. Yay! I'm happy to see this announced! It's too early to leak much more, but I think people are going to be excited about some of the divinities, and the places they're from, in here. I look forward to seeing the powers of the divine on display. Wow ._. This is great. Its good Paizo is finally detailing some really obscure gods, though I wonder which will be all ten of them. I'll be getting a copy of this one. More information on obscure gods of Golarion is always good. Wow.... love the cover btw. Who is Gruhastha, and where did he first turn up? Here is all I could find. Thank you for the detective work! I only just found out about this from Luis' Know Direction Interview, but man oh man, I am excited. Inner Sea Faiths was one of my favorite books that came out in the last year or two and now a chance for a couple Tian Xia gods? All shall be welcome on Sigil's streets! It's really disappointing that we're getting a book on deities that no one has every heard of, but we still lack obediences and boons for the major deities of Tian Xia or Osirian, both of which I assume have far more player support than the nob-entities of this book. Won't be buying. Hei Feng is a major deity of Tian xia, just saying. Wait, there is both a Thunder Duke and Duke of Thunder? They'll have to....duke it out for the title. I...even the comedic “ba-dum-tis” rimshot sounds like approving thunder. There are three Tian Xia deities in this book. Yes! We need more Tain Xia! Hei Feng is one of them, and I suppose Daikitsu and Nilinivati are good choices given their tie to the kitisune and the nagaji race. I myself would like to know more about Shizuru and General Susumu, as they are somewhat linked to dragons. There's also a great chance for Lao Shu Po - given her importance in the distant future - or Tsuki, as he and Shisuru are of great influence in Tian Xia. I'm hoping for one of the deities introduced in Distant Shores. Maybe Kazutal (assuming that's an actual deity in the setting and not some Razmir-esque phony thing). It looks like the cover has been updated - the god on the right looks to be Nivi Rhombodazzle, but the description hasn't been finalized yet. Well, that would be a huge rework into his appearance, but he is a deity. And I'm not sure if Ceyanan is a good inclusion into this book, as he isn't a god nor a Golarion specific deity. I'm guessing that the angelic figure is Gruhastha. That seems very...unique to me. Moreso than Ceyanan. But eh. "A look at three of Tian Xia's most commonly worshipped deities: Hei Feng, the Duke of Thunder; Tsukiyo, the Prince of the Moon; and Shizuru, the Empress of Heaven." I was wondering when the Tain Xian deities would be presented like the other dieties. WOW! Tsukiyo and Shizuru, alongside Hei Feng. Great choices! I can't wait to see Shizuru's illustration. And the other choices were also good ones.. Well, except from the Dwarven god. I was hopping to see Droskar or Angradd. But that's just my personal desires, I'm sure Magrim will be just as interesting as all others. It's been like that since about the beginning of October or so. Probably not until after Thanksgiving but before the end of this month...so maybe by November 30th? Maybe? There are definitely obediences and boons. No clue about any other PC material.